It’s shameful behavior beneath a professional athlete. Equally shameful is the on ice official who buys the embellishment. Don’t know who I blame more for it refs or players. It’s out of control. Something needs to be done. embellishes a fall or a reaction, or who feigns an injury shall be penalized with a minor penalty under this rule. A goalkeeper who deliberately initiates contact with an attacking player other than to establish position in the crease, or who otherwise acts to create the appearance of other than incidental contact with an attacking player, is subject to the assessment of a minor penalty for diving/embellishment. The current system of calling an embellishment is all wrong. In the NHL, officials typically only call a diving penalty when they also call a minor penalty against the other team for tripping or hooking or some other infraction that results in a player being pulled down. The scenario usually looks something like this: Player A has his stick questionably placed as to appear to hook player B. Player B feels the stick, drops his arm to trap the stick against his body, suddenly begins to convulse and falls dramatically to the ice. The referee sees this performance and calls player A for hooking. The linesman, however has seen this show before and calls embellishment. So, what the league is saying is, yes, there was a hook on this play, but since the victim embellished or exaggerated the affects of the hook, both players will be sent to the penalty box for minor penalties and the teams will skate 4-on-4. What came first…..the embellishment or the hook? The first thing I think the NHL should do is change the name of the act from Embellishment to something more humiliating. To embellish means primarily to “make (something) more attractive by the addition of decorative details or features”. That sounds perfectly honorable. One time I was going to get rid of a lamp but I embellished it by adding some beads to the shade and a little spray paint. Still have it. Nothing wrong with embellishment. I vote that the infraction be changed to "Sissy Boy" as in “Brad Marchand 2 minutes for being a Sissy Boy” AND if you’re in the box for being a sissy boy, the area should be lit up pink. Also, the chubby dude who sits in the box with the clipboard (same guy every game every team, right?) should assist the embellisher to apply mandatory red lipstick. It should hurt to embellish. The next thing I’d do is make it a more expensive penalty. I’m not talking dollars, I’m talking minutes. As it is, embellishment is a 2 minute penalty as are most of the infractions that incite it. Making it a double minor would still penalize the initial offender for hooking or tripping, but would have the added benefit of putting the diver’s team on the penalty kill, creating a major diving deterrent. This rule change would be even more effective in the situations when an initial penalty doesn’t prompt the dive, putting the diver’s team on a four-minute penalty kill. I loved that Eddie Olczyk had enough of it and called out Tomas Plekanec and P.K. Subban after Game 4 between the Montreal Canadiens and New York Rangers. It’s the playoffs! Enough with the drama, have some respect for the game. It’s distracting and offensive to true fans. P.K. Subban dives so much it was rumored the Habs had to install a hyperbaric chamber after he joined the team. During the playoffs this season in game 4 versus NYR, Subban jumped up in the air and lifted his skates off the ice to sell an otherwise legitimate high-sticking call against Rick Nash. Subban has skills, no denying that but for such a dirty player he sure works hard to try to get other guys sent to the box. 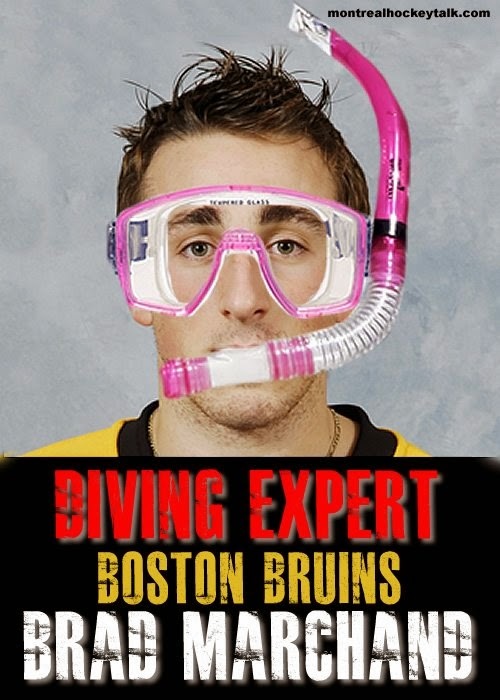 Brad Marchand needs a lifetime ban for his diving/embellishment antics. Looking like someone that was shot by a .50 caliber round over a slight crosscheck to the back (and we don’t need an Oliver Stone-esque breakdown of the man on the grassy knoll. Back and to the left. Back and to the left) is definitely worthy of a time to sit down and feel shame. Alex Burrows is one of the best divers and embellishment guys in the NHL. He even bit Patrice Bergeron of the Boston Bruins in the 2011 Stanley Cup final. Daniel Carcello is another guy who plays on the dirty edge but shamelessly flops and flails to draw a penalty. Pierre McGuire called this play "complete and utter fraudulent behavior"
It pains me to include Kris Letang. However, on more than one occasion, he has resembled a fish out of water. Brayden Schenn dives so well I understand he's been invited to the next Olympic trials. He's a good player but is as irritating as a wedgie in public when he dives. Ryan Kesler; with all the acting that pretty boy does you’d think someone would have cast him in a movie by now. He was once named was named the NHL's worst diver according to a report by TSN Insider Darren Dreger. Martin Brodeur is one of the NHL's most decorated goaltenders, but he also has a reputation of flopping down to the ice. Whenever a player encroaches ever so slightly on Brodeur's crease, he seems to fall to the ice. 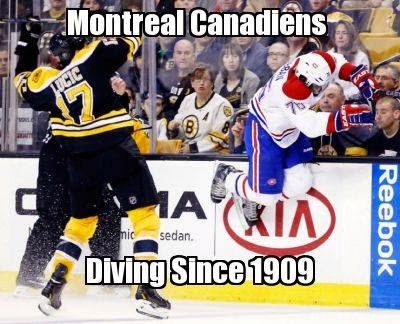 Mike Ribeiro has made a career out of diving. If you didn’t know better, one might think he had an invisible force field around him that causes him to fall to the ice when an opponent is near. Dustin Brown is a hardworking player who loves to hit everyone in his sight, but he is also a player that falls down very easily. Yes, Sidney Crosby is absent from the list. The busted jaw and multiple concussions balanced out the drama infractions. I'm curious if teams who suspect diving, give a hard foul to the diver to let them know what it feels like to be fouled.